Marketing and technology go hand-in-hand these days. And the addition of technology has created some incredibly powerful abilities for marketers. We’re still just human beings trying to get a message out to other human beings. So what role should that human connection play in your marketing? It’s a topic we cover in MarketingSherpa Podcast Episode #1 — you can listen to below in whichever way is most convenient for you or click the orange subscribe button to get every episode. I can’t say this is the first MarketingSherpa podcast. 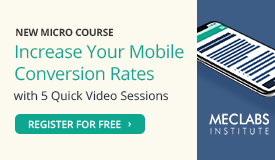 Long-time readers know that MarketingSherpa has been publishing and producing helpful content since the early days of marketing and has had a podcast before. In fact, MarketingSherpa has written about marketing for so long that our first article about podcasting was published three months before Apple added formal support for podcasts in iTunes (If you’re curious, see Integrated Ad Campaign Results – Podcast + Avatar Banners + NYC Bar Coasters published on March 22, 2005). 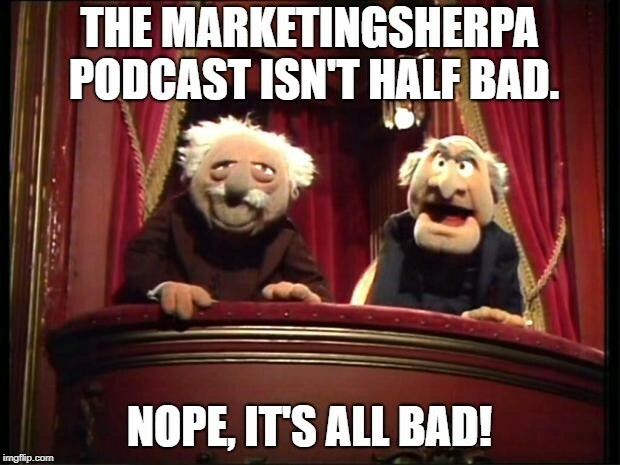 But this new iteration of the MarketingSherpa podcast is our latest attempt to provide you the insights and information to help you do your job better. Plus, we attempted to make this a fun and lively discussion. We’re not sure if we’re going to do a podcast long-term, but we figured it was worth a 90-day experiment (so if you have any feedback, please let us know). Since you’re marketers as well, we thought you might be interested in some of our thinking behind the reason we are deciding to experiment with this format for our audience. When deciding what channels to embrace, it is important to understand if your ideal customer is there and using it already. It’s all too easy to follow the hype. After all, even if a channel is “free” like social media or podcasting because it doesn’t require an immediate monetary outlay, nothing is ever truly free. As MECLABS Institute Managing Director and CEO Flint McGlaughlin said in a recent MarketingSherpa blog post, Burn your “also(s).” Every new channel you invest in, every new social media account you open, every new content type you create diverts your team’s limited time and attention from something else. (That’s why we’re launching this 90-day experiment to gauge if the podcast is a worthwhile investment of our time and attention long term). In MarketingSherpa’s case, we have a business audience (marketers), and the data says that a large group of business people listen to podcasts. 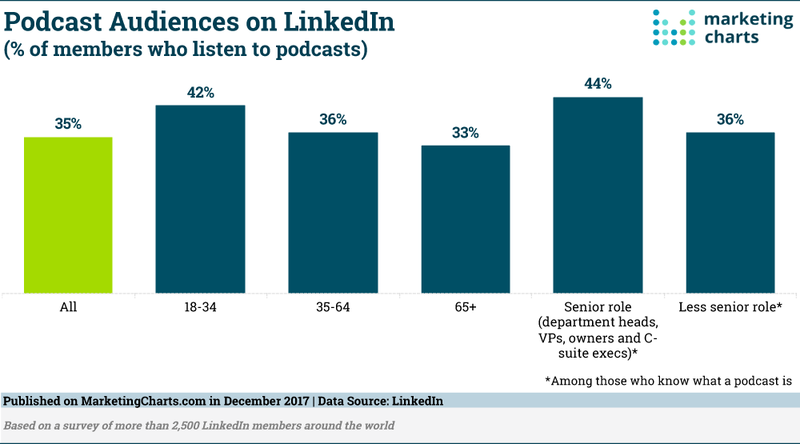 Most notably, 44% of business people in a senior role who know what a podcast is are listening to podcasts, according to LinkedIn data published on MarketingCharts.com (only 8% of respondents didn’t know what a podcast is, so this constitutes a lot of senior role department heads, VPs, owners and C-suite execs listening to podcasts). Because our audience is professional marketers, they tend to like visiting our website from the workplace. In fact, looking at our website analytics reminds me of the gently rolling waves of Jacksonville Beach (which is where I prefer to spend my weekends rather than reading marketing content online, so I can’t blame you for reading more during the week). Look at the clear dips in pageviews on the weekend. And this is where podcasts provide an opportunity to reach a mindshare of our audience that we’re not currently reaching — when you are away from work. 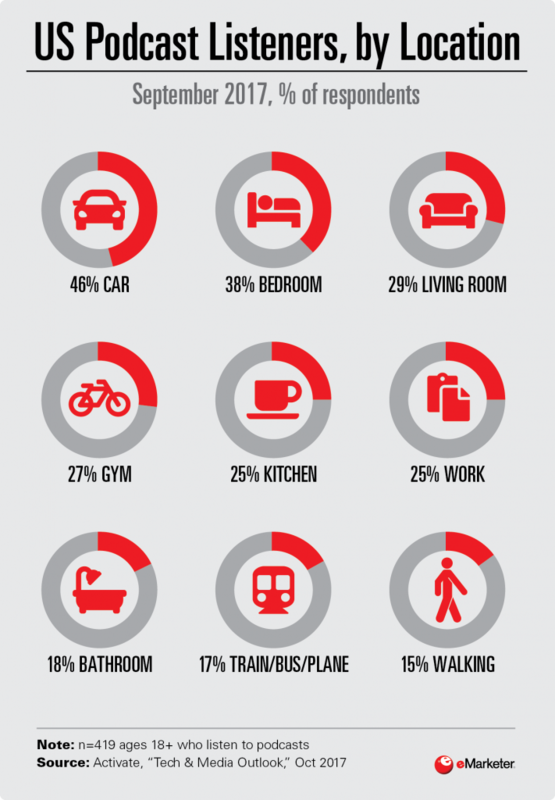 According to Activate data published on eMarketer, only 25% of survey respondents listen to podcasts at work, with many listening while commuting to work (46% in the car and 17% on a train, bus, or airplane), at the gym (27%) or engaged in activities where they probably shouldn’t be listening to a podcast (38% in the bedroom and 18% in the bathroom). Email subscribers who have responded to any of our sends know that we’re real people on the other side of our marketing automation platform. We’ll write you back. We’ll try to help you if we can. And while data, experimentation and forward-thinking MarTech like AI has a vital role in modern-day marketing, our viewpoint is that they exist to elevate the human connection, not to dehumanize the mortal spirit. Because, you know, they’re critics. That’s what they do. They criticize. But we didn’t make this to please the National Board of Marketing Podcast Critics Association. We made it to help YOU. The marketing leader trying to inspire her team and better serve customers. The marketing manager trying to stay ahead of the competition and come up with the next great idea for an email or landing page. Now that you have an understanding about why we’re experimenting with a podcast (which hopefully sparks some of your own ideas), here is a peek into Episode #1, in which you’ll hear me having spirited discussions with Rebecca Strally, Director of Optimization and Design, and Austin McCraw, Senior Director of Research Partnerships, both of MECLABS Institute (parent research organization of MarketingSherpa). 10:13 – We first talked about humanizing marketing with regular employees, now we bring up humanizing the brand by communicating directly from the leader. Austin has some nonprofit examples. 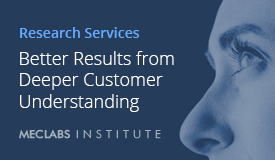 16:53 – “The point is you need to test it and find out what works best for your brand.” That’s the core of everything we do at MarketingSherpa and MECLABS Institute. Hopefully, this provides some ideas and inspiration. But ultimately, different customers will perform differently with different brands. 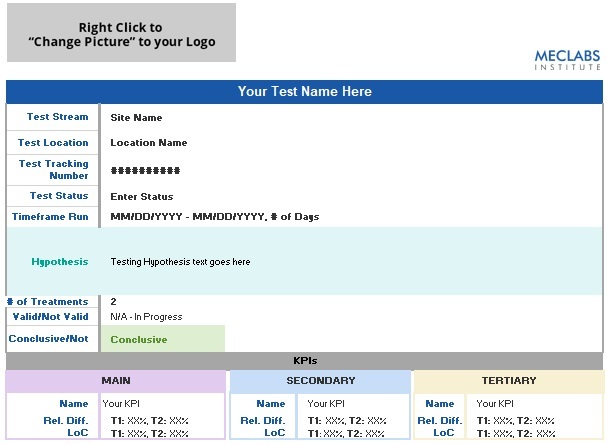 You have to test to see what works best for your unique audience. 22:31 – An example of a website redesign where, even when they used stock photos, they made sure the photos were very personal and human, and not artificial feeling. Rebecca gives some great guidelines about what to look for in stock photos that have humanity, like the camera angle for example. 30:50 – Most of the episode we spent discussing how to humanize your marketing. But we always want to provide an alternative viewpoint. So here we talk about an example where humanizing your marketing actually caused results to decrease. If you’d like to listen to the full podcast, scroll back up for the all the options to download, stream, subscribe, etc. Happy (and productive) listening.